The subject of mechanical drawing is of great interest and importance to all mechanics and engineers. Drawing is a method of showing graphically the minute details of machinery; it is the language by which the designer speaks to the workman; it is the most graphical way of placing ideas and calculation on record. A brief inspection of an accurate, well-executed working drawing gives a better idea of a machine than a lengthy written or verbal description. The better and more clearly a drawing is made, the more intelligently the workman can comprehend the ideas of the designer. Thorough training in this important subject is necessary to the success of everyone engaged in mechanical work. The draftsman is dependent for his success, to a certain extent, upon the quality of the instruments and materials which he uses. As a beginner, he will find a cheap grade of instrument sufficient for his needs; but after he has become expert, it will be necessary for him to procure those of better construction and finish to enable him to do accurate work. It is a better plan to purchase the well-made instruments, if possible, at the start. Drawing Paper. In selecting drawing paper, the first thing to be considered is the kind of paper most suitable for the proposed work. For shop drawings, a manila paper is frequently used on account of its toughness and strength, for these drawings are likely to be subjected to considerable hard usage. If a finished drawing is to be made, the best white drawing paper should be obtained, so that the drawing will not, fade or become discolored with age. A good drawing paper should be strong; should have uniform thickness and surface; should stretch evenly and lie smoothly when stretched or when ink or colors are used; should neither repel nor absorb liquids; and should allow considerable erasing without spoiling the surface. It is, of course, impossible to find all of these qualities in any one paper, as great strength cannot be combined with fine surface. However, a kind should be chosen which combines the greatest number of these qualities for the given work. Of the higher grades of papers, Whatman's are considered by far the best. This paper, either side of which may be used, is made in three grades: the hot pressed, which has a smooth surface and is especially adapted for pencil and very fine line drawing; the cold pressed, which is rougher than the hot pressed, has a finely grained surface, and is more suitable for water color drawing; and the rough, which is used for tinting. For general work, the cold pressed is the best as erasures do not show as plainly on it, but it does not take ink as well as the hot pressed. Copyright, 1911, by American School of Correspondence. The usual method of fastening paper to a drawing board is by means of thumb tacks or small one-ounce copper or iron tacks. First fasten the upper left-hand corner and then the lower right, pulling the paper taut. The other two corners are then fastened, and a sufficient number of tacks placed along the edges to make the paper lie smoothly. For very fine work, however, it is better to stretch the paper and glue it to the board. Turn up the edges of the paper all the way round - the margin being at least one inch - then moisten the surface of the paper by means of a sponge or soft cloth, and spread paste or glue on the turned-up edges. After removing all the surplus water on the paper, press the edges down on the board, commencing at one corner and stretching the paper slightly - if stretched too much it is liable to split in drying. Place the drawing board in a horizontal position until the paper is dry, when it will be found to be as smooth and tight as a drum head. Drawing Board. The drawing board, Fig. 1. is usually made of well-seasoned and straight-grained soft pine, the grain running lengthwise of the board. Each end of the board is protected by a side strip - 1 3/4 to 2 inches in width - whose edge is made perfectly straight for accuracy in using the T-square. Frequently the end pieces arc fastened by a glued matched joint, nails or screws. Two cleats on the bottom, extending the whole width of the board, will reduce the tendency to warp. Drawing boards are made in sizes to accommodate the sizes of paper in general use. Thumb Tacks. Thumb tacks are used to fasten the paper to the drawing board. They are usually made of steel, pressed into shape - as in the cheaper grades - or with heads of German silver, the points being screwed and riveted to them. For most work, draftsmen use small one-ounce copper or iron tacks, as they are cheap and can be forced flush with the drawing-paper, thus offering no obstruction to the T-square. Pencils. Lead pencils are graded according to their hardness, the degree of which is indicated by the letter H - as HH, 4H, 6H, etc. For general use a lead pencil of 5H or 6H should be used, although a softer 4H pencil is better for making letters, figures, and points. The hard lead pencil should be sharpened as shown in Fig. 2 so that in penciling a drawing the lines may be made very fine and light. The wood is cut away so that about 1/4 or 1/2 inch of lead projects. The lead can then be sharpened to a chisel edge by rubbing it against a bit of sand paper or a fine file, and the corners slightly rounded. 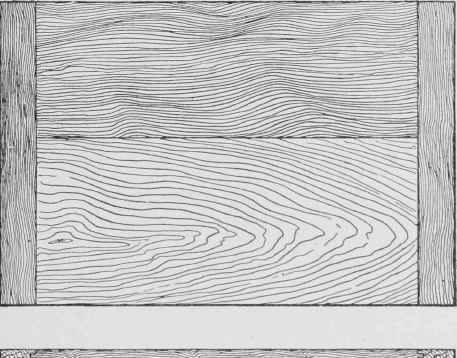 In drawing the lines the draftsman should place the chisel edge against the T-square or triangle, thus enabling him to draw a fine line exactly through a given point. If the drawing is not to be inked, but is made for tracing or for rough usage in the shop, a softer pencil, 3H or 4H, may be used, so as to make the lines somewhat thicker and heavier. The lead for compasses may also be sharpened to a point although some draftsmen prefer to use a chisel edge for the compasses as well as the pencil.